hping2 is a network tool able to send custom TCP/IP packets and to display target replies like ping program does with ICMP replies. hping2 handle fragmentation, arbitrary packets body and size and can be used in order to transfer files encapsulated under supported protocols. Test net performance using different protocols, packet size, TOS (type of service) and fragmentation. -Path MTU discovery . Transferring files between even really fascist firewall rules. hping2 is developed and maintained by antirez@invece.org and is licensed under GPL version 2. 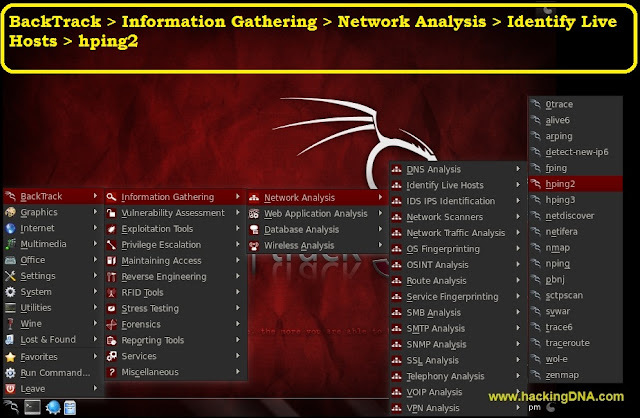 BackTrack > Information Gathering > Network Analysis > Identify Live Hosts > hping2 . Show an help screen on standard output . Stop after sending (and receiving) count response packets. 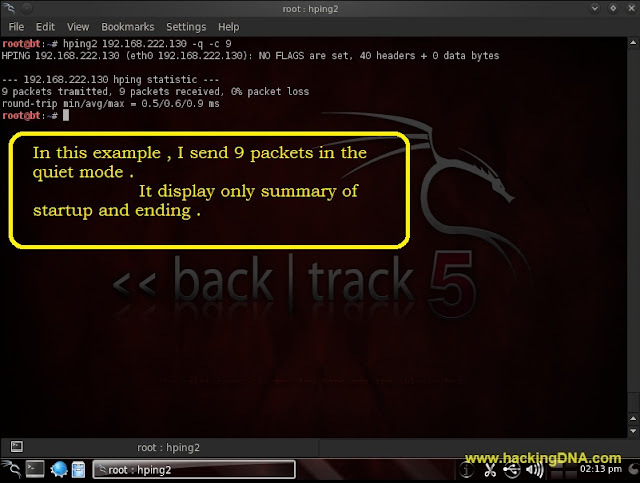 After last packet was send hping2 wait COUNTREACHED_TIMEOUT seconds target host replies. Interval uX set wait to X micro seconds. The default is to wait one second between each packet. Using hping2 to transfer files tune this option is really important in order to increase transfer rate. Alias for -i u10000. Hping will send 10 packets for second. In this example , packets will send at the speed to 10000 micro seconds . Fast way to send packets . Alias for -i u1. Faster then --fast ;) (but not as fast as your computer can send packets due to the signal-driven design). Numeric output only, No attempt will be made to lookup symbolic names for host addresses. By default on linux and BSD systems hping2 uses default routing interface. In other systems or when there is no default route hping2 uses the first non-loopback interface. However you are able to force hping2 to use the interface you need using this option. Note: you don't need to specify the whole name, for example -I et will match eth0 ethernet0 myet1 et cetera. If no interfaces match hping2 will try to use lo. Enable debug mode, it's useful when you experience some problem with hping2. HCMP protocol and other stuff. Default protocol is TCP, by default hping2 will send tcp headers to target host's port 0 with a winsize of 64 without any tcp flag on. Often this is the best way to do an 'hide ping', useful when target is behind a firewall that drop ICMP. Moreover a tcp null-flag to port 0 has a good probability of not being logged. RAW IP mode, in this mode hping2 will send IP header with data appended with --signature and/or --file. ICMP mode, by default hping2 will send ICMP echo-request. UDP mode, by default hping2 will send udp to target host's port 0. THIS IS HOW WE CAN USE THIS TOOL , MORE EXAMPLES TO BE ADDED IN THIS TUTORIAL SO KEEP VISITING www.hackingdna.com . VISIT www.hackingdna.com everday for great BackTrack 5 Tutorials .